22 AprThe Greatest Starbucks Story EVER! Late Monday night I stopped into Starbucks in Port Authority while I waited on Kwaku (my husband) to come and pick me up. With sleeping Dylan in my arms, I needed a place to sit comfortably until he arrived. Starbucks was the only place open so I went there, and asked if I could sit for a few minutes. The gentleman obliged me and told me to just order a cup of water. I took my cup of water, sat with Dylan, my purse, and a heavy tote bag in my arm, and waited for Kwaku. Once he arrived we headed home and went on with business as usual. Tuesday morning, the manhunt began. I’m tossing everything out of my tote and onto my bedroom floor to find my WALLET. Nothing! It was MISSING! My mind wanted to panic, but I calmed myself down and prayed for the Lord to guide me to my wallet. I decided to go about my day and focus on work and not this missing wallet with my identification, debit and credit cards, and approximately $1,000 worth of gift cards that I was carrying (that’s another story). As the day passed, my wallet never surfaced. At this point I’m mentally retracing my steps but I can’t recall a moment where I had used my wallet! I felt a little anxious to cancel my cards, but I remembered my prayer and decided to be patient and wait on God. Yes it was tough, and yes I got a little worried, but not enough to abort my prayer. Moving on to today, I checked in with God about my wallet, because I started to feel a lot more doubt. As I prayed, I heard the Holy Spirit tell me to check at the information booth at Port Authority when I go in to the city in the evening. After an evening of laughter and fun with my sis Christina Faison at the #actuallyshecan film screening and reception, she and I decided to take a long walk to Port Authority to take our transit home. When we arrived I said to her “I misplaced my wallet earlier this week and I need to go by the information booth to see if they have it there.” Christina came along with me to the booth, where the attendant informed me that she didn’t have it there but since I mentioned I had gone to Starbucks, I should check there. Can you believe it? The night that I was there in Starbucks with Dylan I must have placed it on the table to dig in my bag, and forgot to pick it up. Port Authority is one of the busiest transit area in NYC, so thousands of people come through there each day. My wallet could have gotten into the wrong hands and things gone downhill from there. BUT GOD! Because of God working through Jamila, I got my wallet back with everything in tact, nothing missing, everything RESTORED to me!!! I thanked Jamila profusely for her heart and her honesty. But I’m here to share this with you because there may be a place where you’re trying to move ahead of God to get what you want to see. You might be tired of waiting or expecting Him to deliver on His word. Like me, you may have lost something and feel like it can’t return. God always protects His kids! Why? Because He loves us! The Lord knew how much work it would take for me to recover everything in my wallet, but His love protected me from my own mistakes. God wants to direct your path! He wants to give His wisdom, clear concise instructions on how to operate, but in order to do so we have to consult with Him and get in line with His way of doing things! A big part of me wanted to sneak and drive to the city today with no license “by faith”, but then I would have missed the opportunity to go through Port Authority, see Jamila, and get my wallet. God is faithful to us no matter how faithful we are to Him! I don’t deserve the grace that I have in my life, I make plenty of mistakes and I’m not always pleasing to God. But His grace (unmerited favor) is there as an insurance policy to allow me moments like this where only God could have been in the midst of this scenario. Don’t worry! Count it all joy! Yes I wanted my wallet back that night, and yes I had moments of anxiousness and doubt between Monday and Thursday, but not enough to abort my prayer for my wallet to return to me. I cast my care on God, went on about my daily business and made a choice that this wallet incident would not be a distraction. I couldn’t resist sharing this with hopes that it will inspire someone else. 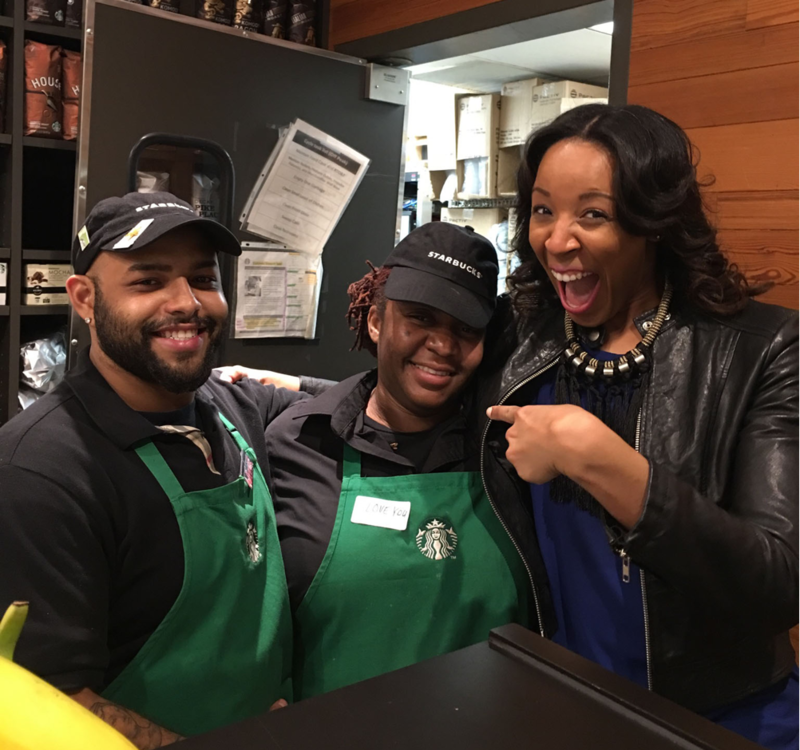 Jamila is one of many “Good Samaritans” out there, but I am so blessed to have crossed paths with her at Starbucks in Port Authority! And while the coffee is good, the culture is greater! Thank you Lord, and thank you Jamila, for your decency and kindness toward me. And thank you Starbucks for creating a business culture where honesty is encouraged and staffing with people of excellence who truly show care towards your customers! Join me and Brandice at the 2016 “What Women Want” Conference!!!! I promise it will be amazing! Share this story with a few GGs who could use some encouragement today! With love and extreme gratitude! Milaaaaa!!!! I am so proud of you!!! You are truly awesome and Sybil you are truly blessed to have found your wallet in the hands of God and Mila. She is a gem; one of rare and fine qualities. I'm happy to hear your story and over joked to know that it is a friend/sister of mines. You both rock!!! Thanks for sharing!!! Yes she is a gem! I'm so grateful! Jamila is coming to our conference in June, I hope you'll join us there as well!!!! Information is on webpage "2016 Conference"
Great sorry, I was in the same situation this month, my 15 year old daughter dropped her wallet that had $150 in it to pay dance class fees. She called me crying saying she lost it. Of course I was furious. The very next morning, a male from the methadone clinic nearby calls out to her, here is your wallet you dropped it yesterday. All the cash was inside. I left the house that morning pajamas and all to thank him. His response was I was going to hold that wallet until I saw her or you. The point is I judged some of those methadone patients for years and look who gave back my wallet. God is so good and has a way to open your eyes and show you things. As for Jamila I know her personally for a long time and she is absolutely a sweet and giving person. Yes! You never know how God wants to use a person in your life! Treating everyone with love and respect is the key! Great share Kisha! Such an amazing story and truly the inspiration I need today! God bless you! What an amazing story!!! God is so faithful, yes Sybil you are highly favored because you have always been such a blessing. I pray for blessings on that young ladies life like she's never received before. I love this story! God is so faithful! !